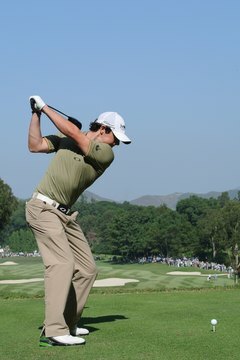 When Rory McIlroy makes a proper pivot, his right knee remains flexed and his right foot doesn't roll to the outside. Although it's a fairly simple movement, most weekend players continue to struggle with their backswing pivot. Once they pivot incorrectly, it's difficult to uncoil properly during their downswing. And since these movements form the basis of your swing, these bad habits make any other improvements difficult. Fortunately, the right drill can help you learn how to do these two movements correctly. Stand straight up with your spine erect, feet shoulder width apart and your upper body centered between your feet. Cross your arms across your chest, with each hand touching the opposite shoulder. Keep your arms in this position throughout the drill. Turn your shoulders to your right (if you're right-handed). Your upper body should remain centered and your spine erect. Your right hip will move straight back and you'll feel some pressure in your right knee as you try to keep it from moving to the right. This tension is a key component of a proper pivot; it means your right knee is stable and you're turning around your right hip joint. Your left knee will bend toward the center of your stance. Turn all the way back so your chest faces to your left. Your left knee moves back to its original position and then, unlike your right knee in the previous step, you allow it to keep moving left. This lets your weight roll onto the outside of your left foot. Your right hip will swing around to allow this, and you'll end up on your right toe. Your spine will remain erect. Go back to your starting position, but this time flex your knees slightly and tilt your spine forward, which may feel as if you're sticking your rear end out slightly. This mimics your setup position; note how this feels, then go back to your starting (erect spine) position again and flex your knees again. Turn to the right again, this time with your knees flexed. The movement should be easier this time, and it should be easier to keep your right knee in place. Bend your spine forward slightly from this position – knees flexed, chest facing right. This may feel a bit strange, but this is your position after a proper pivot. Again, notice how this position feels before returning to the position that began this step – spine erect, knees flexed, chest facing right. Turn your chest to your left (finish) position again but keep your spine erect and knees flexed. This is your finish position after you uncoil correctly. Again, pay attention to how this position feels. Take your original start position, but this time flex your knees and bend your spine forward so you're in your address position. Keeping your spine bent and your knees flexed, pivot completely to the right-facing position. This is your backswing position. Uncoil into your finish position. You can practice this drill anytime without a club to ingrain the feel of a proper pivot and uncoiling motion.